Copper phthalocyanine, showing herring-bone stacking. Click for 3D. 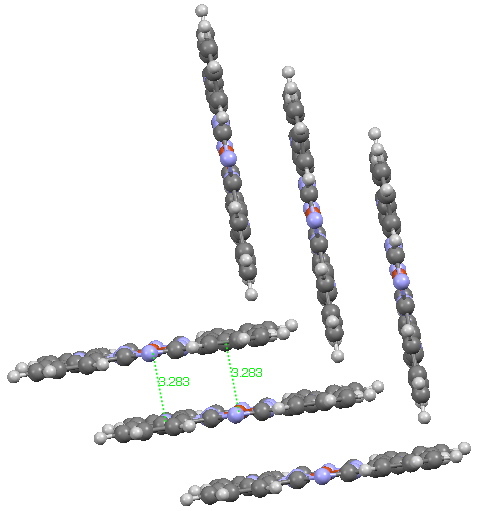 The X-ray structure (above) shows layers of the phthalocyanine, dislocated so that the Cu of one unit aligns perfectly with a N of the units above and below the first one (Cu-N 3.28Å). This corresponds to the di-axially solvated system I explored in a comment appended to the original post. The TD-DFT calculated (since each unit is a doublet radical, the dimer was treated as a triplet state, this being much lower in energy than a singlet closed shell state) electronic spectrum for two units, stacked above each other as shown above reveals two transitions at ~ 600 and 620 nm. This is still some way away from reproducing the measured (solid state or solution spectra). The hypothesis must now be that the effect of such π-π stacking on the electronic spectrum converges only slowly with the degree of stacking (if indeed it is that that is the root cause of the 710nm transition). A calculation on a triple-layered model is currently under way (this being the absolute limit of what can be done without a periodic boundary model). The spectrum will be appended to this post in a week or so (see below). There is little sign of the spectrum evolving a quite separate band at 710nm. The model is still incomplete! This entry was posted on Monday, April 4th, 2011 at 2:30 pm and is filed under Interesting chemistry. You can follow any responses to this entry through the RSS 2.0 feed. You can leave a response, or trackback from your own site.